How long have you been devoted to sculpting, and what sort of work do you focus on? I have been a professional artist for over 20 years, and mosaic has been my main medium. I love to work to commission and also make my own artworks. I have worked on projects from mosaic gardens for the BBC to a book called the art of mosaic and sold work to Nicole Kidman. I love to work on exterior walls as my work plays with light. I like to give a very feminine and magical quality to my mosaics. My aim is to inspire a sense of joy and appreciation for beauty. You also design for the underwater world. Tell us more. I design structures for underwater display, specially for regeneration purposes. I love working with artificial reef technology to make living sculptures and love the concept that art work can simultaneously serve the environment. I am excited to be helping marine conservation in coastal communities. My approach to transplanting the corals on the steel structures has similarities to how I select glass and apply it to my own artwork. I collect baby corals from the surrounding reef - only the loose and damaged corals. The transplanting process can be compared to a gardener lovingly tending to flowers and thinking of the colours, how they will grow over time. Nature and celebration of life... the ocean gives me so much joy and I dream that the whales will still have a home with in them when I am still a grandparent! My most recent underwater project, The Coral Goddess, is a living artwork dedicated to the health of our seas. This regeneration project is also the beginning of a dream since the electric charge to the structure is powered by clean energy with the use of wind and solar panel unit. Tell us more about the Coral Goddess. The Coral Goddess is a living marine eco system and art form that will keep evolving; a nursery for fish and coral that can overflow and repopulate the surrounding areas. Part of The Marine Foundation’s Living Coral Art Project, it merges marine science and creativity to create strong, positive and visual images to raise awareness and provide an innovative eco tourism attraction to generate ongoing income for coastal communities. It is possible to visit the goddess in Pemuteran, Bali, where you can snorkel from the Biorock® centre, see her from a glass bottomed boat, or shallow dive with Bali Dive Academy. Blue corals were used for the upper petals of the lotus flower form and more textured corals for the lower leaves. Through the Living Coral Art Project, we hope to continue our work with communities, creatively directing artists, brands and others (as in Gili Trawangan during the Biorock® workshop) in the creation of underwater installations. What response has the Coral Goddess created within the local community? I've always felt that it is important to involve the local community as much as possible in any environmental project. 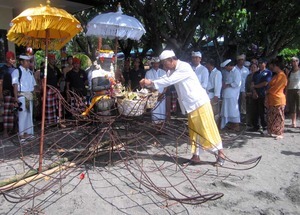 In Pemuteran (Northwest of Bali), Pak Prana who owns Taman Sari Resort decided that the goddess should be blessed during a ceremony being organised for the opening of their new Pejalang Laut Centre (local council), which has been protecting the bay from destructive fishing. The blessing was very moving and involved all Balinese. They believe the ceremony gave magic to the coral goddess, and I was so moved at how everyone came together, not motivated by money but by a shared goal and dream, a true community effort. I would say that the conservation work here has been successful not just with Pak Prana's environmental vision and financialsupport but sensitive leadership as well - this has helped him bind the community together, which is the most vital ingredient for long-term success. A manta ray shaped Biorock structure at Gili Trawangan with vibrant coral growth just after two years, attracting humans and creatures alikeRani E Morrow-Wuigk (the regeneration project founder) and I managed to raise the money with the support from small donors from around the world but aside from financial donations, it is people's time and contribution of their skill and enthusiasm that made and is making the coral goddess possible. Rani E Morrow-Wuigk (the regeneration project founder) and I managed to raise the money with the support from small donors from around the world but aside from financial donations, it is people's time and contribution of their skill and enthusiasm that made and is making the coral goddess possible. What shapes have you created for Biorock®? A: In Gili Trawangan we have created the manta ray, the turtle, the starfish, the dolphin, the heart and more. The structures, no matter what design, should be stable under their own weight - so basically bottom heavy. The material we use for Biorock® is steel with open frame, allowing waves to pass through, hence losing energy on the way. So the structures remain grounded. Give us a little of your background. I spent my childhood running around an amazing art gallery in London where my mom worked. One month it would be full of Picasso the next year Matisse. It was amazing and very inspiring. When not at school or surrounded by art, I was with nature, which I loved it and found so inspirational and joyous. I always drew a lot as a child. I started to make mosaics at 19 and have since never looked back. I did my PADI scuba diving course in Zanzibar followed by dive master training in Costa Rica. It was there when I started to truly understand the issues that face marine eco systems. I became intrigued by how much divers loved shipwrecks; a concept bubbled within me to approach coral regeneration in a positive and creative way. Socio-economic factors are so key in the on-going success of conservation. Our next project is in this October with Deus who have several stores in Bali. They are a cool surfer bike crew and the project should attract a new and wider audience to support the world of the marine environment. The project will also be held with Gili Eco Trust. Photos courtesy of Imran Ahmad of Escape Inc, Foued Kaddachi of Foued Biz, Rani E Morrow-Wuigk and Celia Gregory's sources. Wish to gain the experience of reef gardening and restoration? Join Gaia Discovery and Gili Eco Trust in their joint-project on 10 December 2011. We will build new Biorock reefs, and need divers to join us.